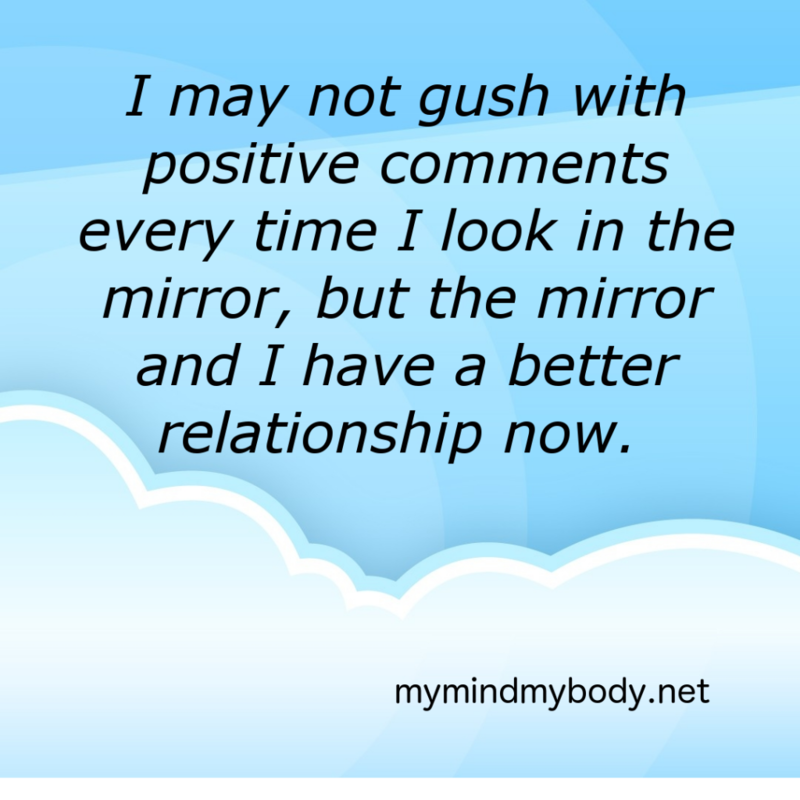 My intuitive eating journey included many obstacles, one of which was making peace with the mirror. Check out the article “Mirror, Mirror” for more about this experience! I use two mirrors in my house. The bathroom mirror, in which I check to see how much more my face is sagging today, and/or how my hair needs to be fixed. I also have a full-length mirror in my bedroom, in which I check how I can improve each outfit, though I usually just end up throwing up my hands and saying well, I’ve done the best I can. Today I had an interesting experience. I had gone outside to brush my dogs and fill all the birdfeeder, and when I walked back up onto my deck I saw myself full-length in the sliding glass door. And what I saw was a person. Just, a person. Not grossly disproportionate, not particularly feeble, not especially decrepit, just a person. It made me realize how I actually treat myself and mirrors. I’ve done lots of work on trying to be more self compassionate and positive, so what I tell myself is I say nice things to myself all day… when in fact I say stuff to myself that I barely even hear in my own mind, and that moment made me much more aware of it. Thanks for reading all that. I really enjoy your blog. I think this is a very powerful story and I hope others take the time to read it! Seeing ourselves as more than a label or just a physical being is so important. Yes, we are people as you stated in your “oh, a person” thought when you saw yourself in the mirror, but I believe that you seeing yourself in the mirror as nothing more than a reflection shows that you see yourself as a genuine human with feelings and emotions and personality. You are more than your reflection! WE are more than our reflections!